The motto "Esse quam videri" means "To Be Rather Than To Seem." The "pole with a cap" is a liberty pole. In 1971, the seal was officially standardized after the state's chief deputy attorney general discovered that there was more than one version in use. 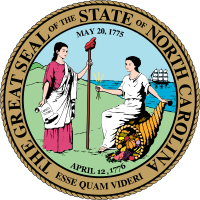 In 1983, state Senator Julian R. Allsbrook proposed a revision to the seal to add to the seal the date April 12, 1776, the date of the Halifax Resolves; this revision was approved by the state legislature. These two dates are also on the flag of North Carolina. This page was last edited on 19 March 2018, at 22:54 (UTC).